The Arch of Reunification is a sculptural arch located in Pyongyang, the capital of North Korea. 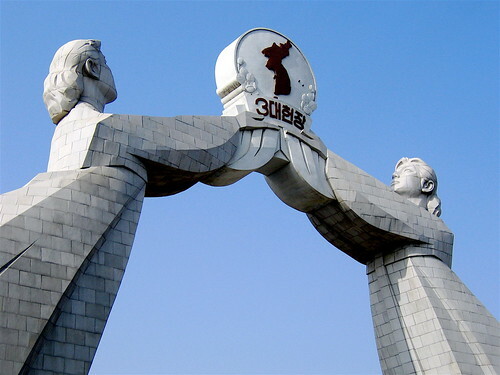 It was constructed in 2001 to commemorate Korean reunification proposals put forward by Kim Il-sung. Photo: bryanh/flickr. What do student exchange programs have in common with prisoner exchanges; and what does the release of information on missing persons have to do with a game of soccer, or a joint-economic development project? They are all examples of measures that can be used for confidence building in peace processes (albeit in different contexts and conflict phases). Generally speaking, confidence building measures (CBMs) can be understood as “a series of actions that are negotiated, agreed and implemented by the conflict parties in order to build confidence, without specifically focusing on the root causes of the conflict.” In other words, by letting parties collaborate on something that is not strategically important to them, they build the trust needed to subsequently address the strategic issues. One of the many leftovers from the Cold War is the perception that CBMs are only relevant in the military field. Yet, as the examples above indicate, they can take place in the humanitarian, political, security, economic and social sectors – and ideally even cross-sectoral, as Simon Mason and Matthias Siegfried point out in their recent contribution to an African Union (AU) handbook on Managing Peace Processes. In light of the increasing call for a regionalization of peace processes, the handbook is a particularly timely publication. It is designed to serve as a reference guide for AU practitioners, building on comparative experiences. So what are the main lessons learned for mediators in the field of confidence building measures? Negotiations may be hindered by a lack of trust between the conflicting parties; a lack of political will to change the status quo; or a lack of a common understanding of the conflict. Parties may use CBMs as a stalling or cover-up tactic, to signal to the international community or their own constituencies that ‘they are doing something,’ without having the intention of actually changing the status quo. To minimize the risk of this is happening, mediators need to clarify the motivations of the parties for using CBMs, be it bilaterally or in plenary meetings. CBMs may be so successful that they take pressure away from the parties to address the real issues; mediators thus need to be careful to ensure that CBMs do not distract from the real negotiations. If CBMs are not clear and not verifiable, the danger is that they are not implemented, or implemented in a manner that is not helpful. This can lead to greater distrust than before. A modest CBM with clear implementation modalities is preferable to an ambitious one. In general, CBMs are most effective if they are designed in a symmetric manner, involving equal commitments and impact on both sides. Premature concessions that are not reciprocated may be counter-productive, increasing mistrust between the parties or leading to a (perceived) loss of face for one side. Of course none of the above arguments are clear-cut: it may, for example, sometimes be better to just ‘do something’ than not to do anything at all, even if it is misleading about the actual progress being made. In particular, the last point regarding symmetrical design is tricky: when there is a great power imbalance, the more powerful actor may take unilateral action without risking much. Thus, a mediator can ask parties to make unilateral gestures, if this seems the only way out of a deadlock. In short, there is no cookie-cutter solution. CBMs, like other ingredients of peace processes, need to be tailor-made for the conflict that they are seeking to address. While a mediator can come up with suggestions or caution against weak or risky CBMs, the final responsibility to choose the right type of CBM rests with the conflicting parties. Much in the news recently, the case of the Korean peninsula illustrates both the opportunities offered by CBMs and their limitations. A chapter on ‘Exchanges and Cooperation’ in the 1991 Basic Agreement between North- and South Korea provided the basis for non-military CBMs. Family reunions and private-sector-led economic interaction helped ease military tensions, especially during the era of South Korea’s “Sunshine Policy” (1998 to 2008). Despite progress on the social and economic front, however, no breakthrough was made on the political level. When the conservatives took power in the South in 2008, they abandoned the sunshine policy, arguing that the North was not serious about reciprocating CBMs and engaging in denuclearization. The Kaesong Industrial Complex, a jointly-operated industrial park in North Korea, became one of the last remaining symbols of cooperation, continuing to run even when tensions elsewhere escalated. The recent decision to effectively close the complex shows how fraught relations have become. This serves as a powerful reminder that, even if implemented in a carefully planned and long-term manner, CBMs are but one piece of the whole peace process jigsaw puzzle. Read the full chapter on CBMs here. Valerie Sticher is a program officer in the Mediation Support Team at the Center for Security Studies (CSS) at ETH Zurich.